Brazenly vaulting off cliffs measuring 70+ feet is a rush unrivaled by anything this side of Shark Week. And these 15 cliff jumps prove you don't need to leave the states to chase your acrophobia-fueled adrenaline kicks. If you do decide to jump, cross your fingers—because many of these dives are illegal—and your legs, lest your manhood swell to the size of ripe cantaloupes. Proceed safely! I don't need (anymore) blood on my hands. Located outside the Grand Canyon in the Havasupai Reservation, these falls feature crystal-blue water and an absolutely monstrous 125-foot drop. With that extreme height, the jumps are incredibly dangerous. However, if you do die in brutal fashion, heaven might be a letdown after seeing a place like this. Probably the leap tinged with the most history, the Kaunolu cliff is commonly recognized as the spot where cliff jumping, as we now know it, first gained prominent attention. Kahekili, the "birdman" king of Maui, would send his warriors off the 63-foot cliff (and into the shallow waters below), in order to prove their loyalty and bravery, or else risk utter shame. So basically, these guys would literally jump off a cliff because their friends did, too. Just one hour outside of Los Angeles, this renowned spot has appeared in multiple films (including Planet of the Apes), features jumps varied from 20 feet to 70 feet, and water depth safely in the teens. My cliff-diving connection in LA assures me this is the best spot in the area, but to avoid the water in mid-summer, as it tends to become a little stagnant. Crater Lake is the deepest lake in America, and the moderate summits certainly aren't as intimidating as some others listed. This means the white-hot danger factor isn't quite as volatile as other entries, despite the National Park Service offering some very real and stern warnings to those who jump. The real draw here is the beautiful, crystal-Pepsi clear lake water and the picturesque Pacific mountain scene, better suited for a Swedish art film than an afternoon of cliff jumping. Still, all that juicy serenity will be shattered as soon as you hit the freezing H20—that takes some serious huevos to hit. Tally Lake—centered in Montana's Flathead National Forest—has remained a hotbed for adrenaline junkies in the area for generations. 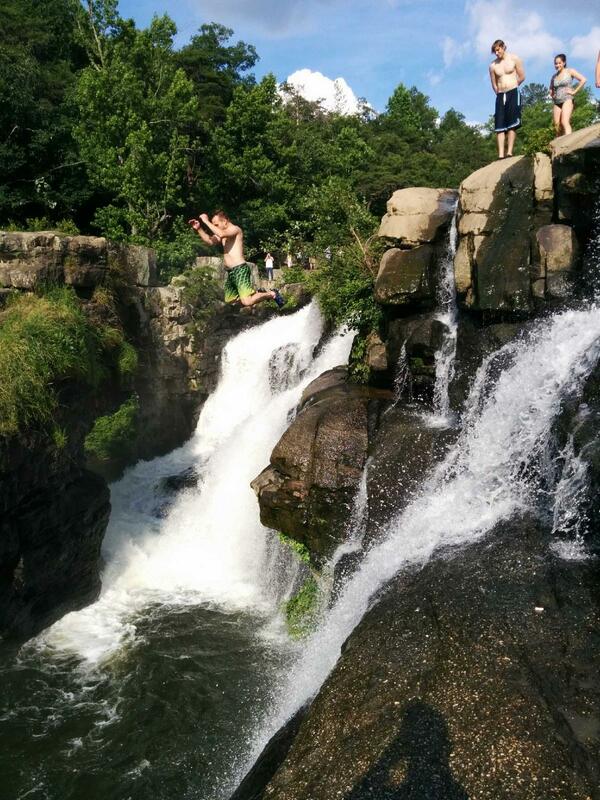 The cliffs, which include a massive 100-footer, ends with a heavy splash into the lake. Local authorities have repeatedly warned thrill-seekers that no one's safety is assured, but isn't that kind of the point? As you stand atop the vertigo-inducing 90-foot precipice of Devil's Island, you face the prospect of leaping into a body of water called Hell's Gate—a blistering 55 mph free fall. They might as well call this jump the "You're F*cked, Buddy." Red Bull chose Possum Kingdom Lake, a popular Texan party local and cliff diving spot (obviously), for their annual Cliff Diving World Series competition in 2014. And how could they not with a theme song like this? If staggering 80-foot falls don't deter you from this quintessential South Burlington leap of faith, the frigid waters of Lake Champlain might. Still, the Red Rocks Park jumps remain a staple of Vermont culture, like maple syrup, and looking down on people who don't watch PBS. If you thought Wisconsin was all about cheese, and not so much about aquatic extreme sporting, you are only partially correct. The limestone cliffs and caves that pepper Door County have long been a veritable playground for outdoor adventurers—even if some decide to stay inside their kayaks. To be fair, they probably have some cheddar stashed in there. I wouldn't leave either. Officially the southernmost point in the US, Ka Lae is another premier example of our 50th state's lofty stature in the cliff jumping arena. Using Hawaii almost seems like cheating, considering it's tropical location, but watch this video and just try to argue against its inclusion. Expect drops up to 75 feet, and even a built-in ladder to help you climb back to the top. Technically in both Utah and Arizona, Lake Powell is a well-known location for lunging oneself off mega cliffs, even though it's prohibited to jump off any taller than 15 feet (side note: there are some 70-footers lurking along the lake). After fatalities creeped into the double digits in 2013, local authorities ratcheted up efforts to keep people from jumping. So, we're pretty sure Slip-'N-Sliding off 50-foot cliffs would be frowned upon, too. Home to Forrest Gump and a legion of people who manage to work "Roll Tide" into every sentence, 'Bama surprisingly has its fair share of cliff jumping opportunities. 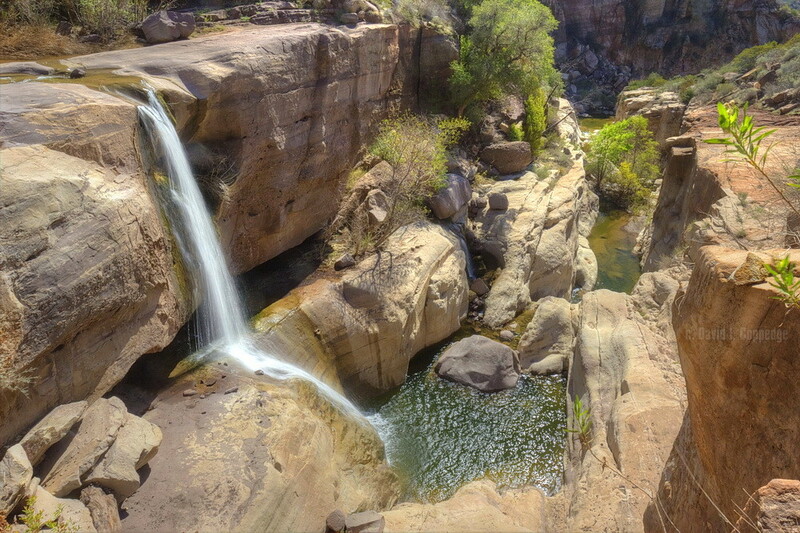 The cliff on the falls is about 35 feet high, and the water leads to a six-mile rapid run, in case you didn't get your adrenaline fix through the air. Tar Creek is probably the most well-known jumping destination in California and sits two hours outside of L.A. It's also loaded with multiple launching points, from the lower 15-20 ft cliffs in Upper Tar Creek, to the 70 ft+ giant downstream. Though it takes a steep three mile hike to reach, the jump is known for the raging waterfall you leap into, making it a one-of-a-kind experience. Just be warned: always check the water level, as multiple people have died from leaping when the creek was dried up. 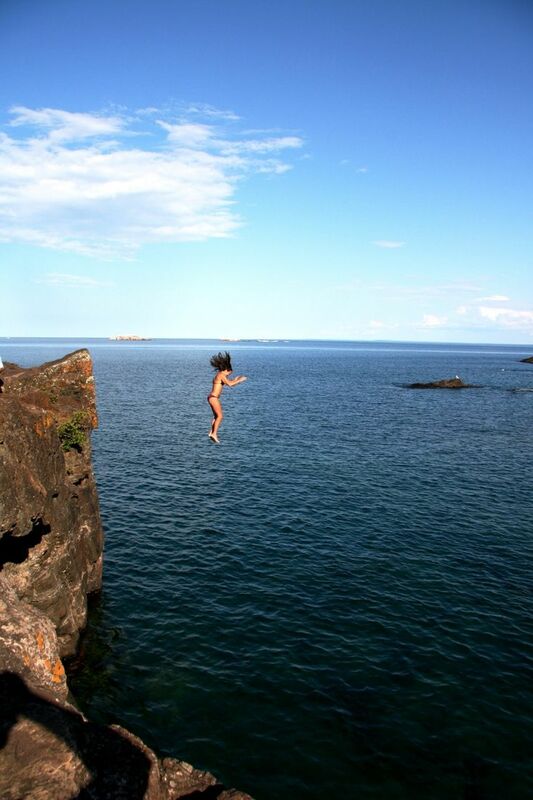 Along the shores of Lake Superior, the memorable Black Rocks, a point of interest for many Upper Peninsula dwellers, jet out and dare revelers to leap from its intimidating peak. Located inside Presque Isle, described as the "crown jewel" of Marquette, Michigan, you can regularly expect a crowd of people watching the scene during the warm weather. In Michigan, that basically consists of two-and-a-half weeks in the middle of August. Might as well live it up, right? It may be a shocker that the land of Ben and Jerry has so many killer cliff hopping spots, but such is the crazy mixed up world we live in. Scattered inside the Green Mountain State is a smorgasbord of deep Quarries, like the one's featured in the video above. However, our resident Vermonter (and editor) Ethan warns that these famous dropping off points are notoriously dangerous. I don't know who to believe. In Lake Arrowhead, two-hours East of LA, lies the cliff jumping allure of Gilligan's Island, aka The Mound. It has 70-foot-high spots and comes with water of a comfortable depth, so, many jumpers opt to dive straight in, headfirst. 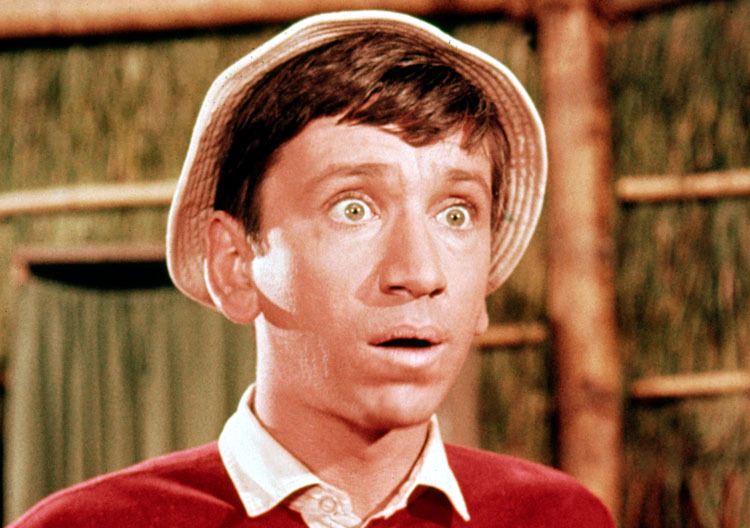 It's nicknamed Gilligan's Island because everyone who jumps receives a complimentary bucket hat. Or at least that's what I'd like to believe. Wil Fulton is a staff writer for Supercompressor. He lost his taste for cantaloupe after writing this article. Follow him @WilFulton.